Exclusive! Return by Seaplane from Victoria or Whistler or Nanaimo to Vancouver, discover spectacular vistas of BC coastlines. Visit 2010 Winter Olympics co-host city - Whistler. Optional boarding at the renowned two worldrecord-breaking Peak2Peak Gondola. 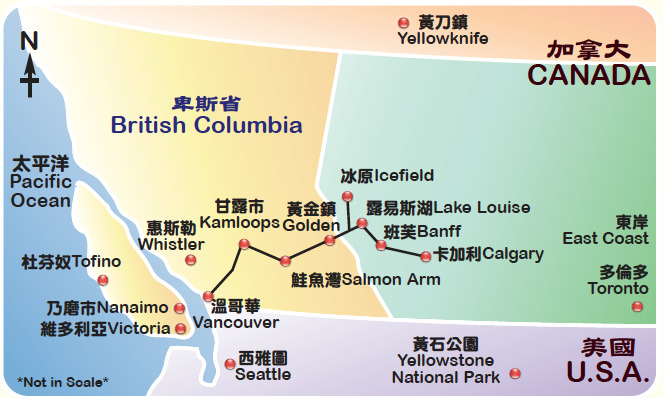 Vancouver Night Tour (per twin room;night tour is complimentaryto max. 2 guests per room; subject to availability; while supplies last). 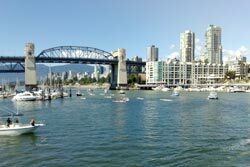 Exclusive Vancouver Night Tour : exploring Downtown, Gastown,Olympic Village and stroll along False Creek for an unforgettablescenery of BC Place and Science World. Exclusive! All Inclusive Meal Arrangement available, including a premium lunch at renowned Chateau Lake Louise. Don’ miss the opportunity to capture more of the Rockies by reserving First 3 Rows during the Rockies tour! Exclusive! Various hotel options in Vancouver. Upgrade your stay in Vancouver to Deluxe View Room at Sheraton Vancouver Wall Centre. Exclusive! Stay at Town of Banff. Optional upgrade to Chateau Lake Louise (Lakeview room) or Banff Springs Hotel. Exclusive! Enjoy a spectacular Whale Watching tour to discover marine habitat, killer whales,humpback whales and more! Please meet at Domestic Claim Belt #8 at CalgaryAirport at approx. 2:15pm. Depart for the RockyMountains. Get settled at your hotel. After passing by the Castle Mountain, explore the worldrenowned Lake Louise, the combination of unspoiled wilderness, beautiful chateau, snow-capped mountains and modern amenities along shores of the dazzling turquoise lake. Enjoy a premium lunch at the famous Chateau Lake Louise (meal plan). Then, start our glacier adventure to the Columbia Icefield at the Jasper National Park. Ride on the massive Ice Explorer (adm) to trek onto the surface of the stunning Athabasca Glacier. Continue our excitement to Glacier Skywalk (adm) above the Sunwapta Falls, a glass-floored observation deck separating you from wildlife roaring below and the breathtaking glacialvistas. Passing by Bow Lake and Crowfoot Glacier, overnight stay in Golden. Proceed to Eagle Pass and visit the Last Spike of the Canadian Pacific Railway. Head west to BC interiors and arrive in Kamloops, a city with over 2000 hours of sunshine each year. Visit the only GMP certified Ginseng factory and learn about manufacture and the amazing healing power of Ginseng. After passing by the District of Hope, where Sylvester Stallone filmed First Blood in 1982 and Hunter’s Creek, return to Vancouver by late afternoon. 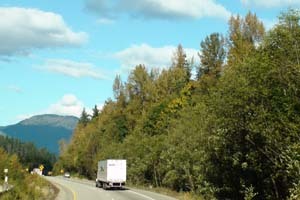 Start the journey along the Sea to Sky Highway. Pass by Horseshoe Bay, the 3rd highest waterfall in Canada-Shannon Falls, the 2nd largest granite monolith-Stawamus Chief and Squamish. Changing altitude takes you to see the waters of Howe Sound, snowcapped mountains, waterfalls and canyons. Arrive at Whistler-North America’s Number One resort and the host of 2010 Olympics Winter Games, then take a ride of the Whistler Mountain Peak2Peak Gondola (optional), you will have time to relax and shop at the mountain or in the village. Return to Vancouver by tour bus, or by seaplane (surcharge applies). Visit the Hatley Castle and the Goldstream Provincial Park to discover heritage and nature wonders. Take a leisurely stroll under a canopy of towering trees and pass giant Western Red Cedar trees over 600 years old. Then, head to Chemainus after visiting the Totem city-Duncan. 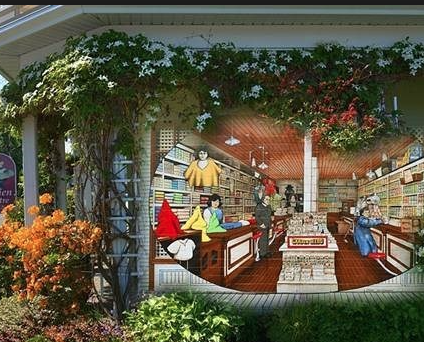 The murals on the streets illustrate the development of Chemainus. Arrive at Nanaimo by late afternoon and take the BC Ferry to Horseshoe bay and then return back to Vancouver. Free day for shopping, visiting friends and family, or dining at nearby Asian cuisines. Transfer to Vancouver airport afterward. Driver &amp; tour guide’s tips at $9 per person per day. Surcharge for transfer to Seattle $50/pax/way. 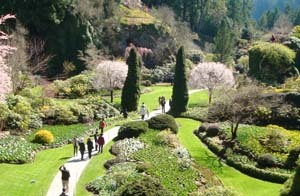 Admission fee included: Skywalk; Ice Explorer; National Park; BC Ferries; Butchart Gardens. 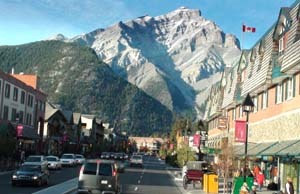 Located in the heart of Banff National Park, on the eastern shore of Lake Louise and within a UNESCO World Heritage Site. Featuring spectacular views of the Lake Louise and the Victoria Glacier, upgrading to the Lake View room is available .